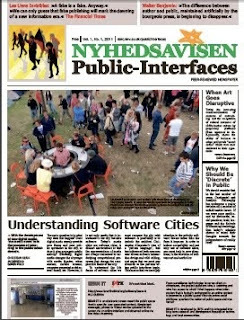 NYHEDSAVISEN: PUBLIC-INTERFACES is a fake newspaper presenting cutting edge research in an accessible FREE tabloid format. The newspaper is a 100% genuine copy of the famous Danish newspaper Jyllands-Posten. The increasing demand for publication of academic peer-reviewed journal articles must be met. Unfortunate examples demonstrate that this may lead to plagiarism. This is not a viable solution. Research must be original and academia is not lacking original content. But perhaps researchers need new visions of how to produce research? Perhaps the readers need new ways of consuming research? Why not imagine academic research as something that can be consumed on a daily basis, in the train or at the breakfast table? On April 1, at 13 am, NYHEDSAVISEN: PUBLIC-INTERFACES will be handed out to the public at the metro station ‘DR Byen/Universitetet’ in Copenhagen as well as at the central railway station in Aarhus and the State Library. Also, issues will be tactically placed in selected free newspaper stands and at University lunchrooms worldwide. Emerging from the Digital Aesthetics Research Center and the Center for Digital Urban Living (Aarhus University), the aim of NYHEDSAVISEN: PUBLIC-INTERFACES is to encompass the changing concept of the ’public’. This is the result of an ongoing research in the computer interface. CONTENT: Our starting point is that the computer interface is a cultural paradigm affecting not only our creative production and presentation of the world but also our perception of the world. We recognize that in the past decade, interfaces have been expanding from the graphical user interface of the computer to meet the needs of different new technologies, uses, cultures and contexts: they are more mobile, networked, ubiquitous, and embedded in the environment and architecture, part of regeneration agendas and new aesthetic and cultural practices, etc.. NYHEDSAVISEN: PUBLIC-INTERFACES investigates these new interfaces that affect relations between public and private realms, and generate new forms urban spaces and activities, new forms of exchange and new forms of creative production. The newspaper is organised into thematic strands (URBAN, ART, CAPITAL) and brings together researchers from diverse fields – across aesthetics, cultural theory, architecture, digital design and urban studies – united by the need to understand public interfaces and the paradigmatic changes they pose to these fields. The newspaper and event was kindly supported by Center for Digital Urban Living, Digital Aesthetics Research Centre, and The Doctoral School in Arts and Aesthetics, Aarhus University, Denmark.